This incredible two room suite is, quite possibly, the best family hotel room... ever. The children's room is very large and has 2 twin beds, a couch, a desk, toys and TV, as well as its' own bathroom and even special towels. The adjoining suite for mom & dad has a spacious sitting room, dining area with floor to ceiling windows and a bedroom with a king size bed. A short hall way leads to the bathroom and on to the hall entry. 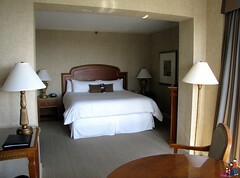 This room, coupled with the Omni's always fabulous service, makes this one of our top hotel room experiences. 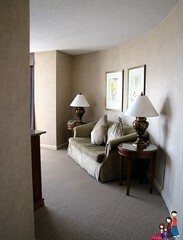 Join the Select Guest program- it's free- for complimentary wi-fi and morning beverage delivery. In the Kids Suite, milk & cookies are delivered nightly. For all other rooms, milk and cookies are delivered the first night of the stay. Kids also receive an Omni Sensational Kids Pack with fun toys and treats. Any Omni hotel stay is fabulous, but if you can splurge on the Kids Suite at the Omni Mandalay... DO IT! This immense three room suite features a large sitting room, a king size bed room and bath, a beautiful entry way and connected room for the kids with it's own sitting area, twin beds, bathroom and play area. The kids will have milk and cookies delivered each night and receive an Omni Kids pack at check in. For complimentary morning beverage service and free wifi, sign up for the free Omni Select Guest program.